I was with a faithful believer Koffi the other day. He asked me if he could finish out some classes towards his theology degree and if his wife could join the Bible college as well. She had come to him after camp asking him if he thought she might be able to do formal Bible studies this year. Koffi has already finished the basic degree, but he wanted to prepare his life for the next step. They are the second couple pictured in the photo below. 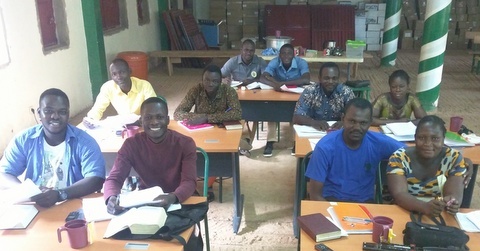 We started our French Bible College in 2007 in Ouagadougou. The aim was to equip the young men (from our churches) that God gave us to train for the ministry. We also opened it up to members who wanted to grow in their faith in order to be used of God. 15 men have already graduated and been sent out to pastor all over the country. Other members have also graduated. We had our first class of this new school year last week. (Classes meet one week out of the month.) I was thrilled with the fact that we added a number of students like Koffi and his wife. Five of our current students are actually university students, a great blessing as not many young people here even get their high school diploma and go to university. It is amazing that God has given us quality young men with a great desire to be used of God. I am excited about what the opportunity holds for these young men and so many other Burkinabes. We have a second Bible college a few hours away that is done in the tribal tongue Moore. It will begin in November, and we should have four new students attending this year.